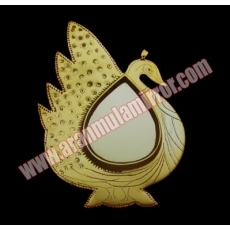 This model of Aranmula Mirror is known as the Peacock Mirror. this is the symbol of prosperity.so people used to buy it for housewarming and keep in their own houses. It has been christened so as the frame on which the mirror is fixed reminds us of a peacock. Equipped with a stand, it is ideally suited to be placed in show cases.It has an adjustable back stand.